At CARE Wellness Center we effectively treat acute and chronic injuries such as back pain, whiplash and neck pain, and all kinds of sports related injuries such as tennis elbow, shin splints, shoulder and knee injuries, plantar fasciitis, or sprained ankles. Dr. Abraham Freeman has been treating Chronic and Acute Pain for over 25 years in Margate Florida, and has assembled a great team of acupuncturists, masssage therapists and physical therapists to complement his treatments. Back Pain caused by sprain and strain are among the most common type injuries we see at our healthcare facility, and they usually are the result of over use and/or stretching beyond the tensile strength of muscle tissue. A sprain is defined as a stretching, ripping, or tearing of a ligament; a strain as stretching, ripping, or tearing of a muscle and/or tendon. Both injuries can be graded 1-4 representing a 25%, 50%, 75% or 100% disruption of tissue fibers. Grades 1-3 are typically treated with chiropractic, acupuncture, physical therapy, exercise and bracing. Grade 4 injuries usually require surgical repair, and represent a severe disruption of the tissue. Treatment of these injuries typically begins with PRICE, which stands for protect, rest, ice, compression, and elevation and is the mnemonic which is used to remember the initial first aid treatment. Ice which is utilized for the acute phase of care on both back sprain and strain injuries, is used to reduce swelling and relieve pain. After the acute phase of care heat is utilized to increase blood flow and help bring oxygen and nutrients to the injured tissues. Light stretching is done to promote fluid movement, maintain a full range of motion after healing is complete, and prevent the formation of adhesions and scar tissue which can decrease functional ability to the affected part which can develop years after the initial injury. There are many nutritional treatments which can be utilized to bring down inflammation, ease pain, and promote tissue healing without the side effects of pharmaceutical medications. If the injury is mild home care will usually suffice. However, if unsure you should have these injuries evaluated and treated by a health care professional such as a chiropractor. Improper treatment of these types of injuries (or non-treatment) will cause problems in the future with mobility, range of movement, and increasing pain. Once a back pain condition becomes chronic, it will become more difficult to diagnose and treat and can cause long term disability. A back pain condition can become chronic if left untreated in as little as six weeks, so it is important to get treatment early and frequently to aggressively eliminate the pain. Cautionary signs that warn you to see your chiropractor are pain lasting longer than 6 weeks, severe localized pain, fevers or chills, previous diagnosis of cancer, inability to control bowel or bladder, or sudden weakness of arms or legs. The majority of cases we see DO NOT require surgery but, again, it is important to start treatment as soon as possible. 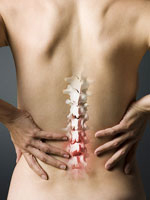 Whatever is the cause of your pain, whether it be disc degeneration or herniation, muscle spasms, strain, sprain, sports injury, vertebral fractures, tears in the ligaments that support the spine, acquired conditions, scoliosis, arthritis, spinal stenosis, or other conditions not originating in the spine itself, it is important to diagnose and begin treatment right away AND to prevent reoccurrence by exercising to maintain strength, establishing good posture, maintaining a healthy weight, quitting smoking, and maintaining healthy bones with calcium and vitamin D.
At CARE Wellness Center, our team of chiropractors and other holistic health specialists can help you get back on track and pain free in no time. Consultations are always free. Call and schedule yours by dialing 954-586-8088. We have a long track record of success treating the residents of Margate, Coral Springs, Coconut Creek and Pompano Beach. Don’t stay in pain a day longer. Come in and see us!